BELMONT — East Liverpool dropped to Division III, but it won’t be any easier for the Potters. Perennial state power and third-ranked Berlin Hiland received the top seed in the East district girls basketball tournament draw Sunday. East Liverpool opens sectional play at sixth-seeded Sugarcreek Garaway on Feb. 23. SEEDS: 1. Berlin Hiland; 2. Bellaire; 3. Zoarville Tuscarawas Valley; 4. Magnolia Sandy Valley; 5. McConnelsville Morgan; 6. Sugarcreek Garaway; 7. Lore City Buckeye Trail; 8. Belmont Union Local; 9. Martins Ferry; 10. Rayland Buckeye Local; 11. Cadiz Harrison Central; 12. Barnesville; 13. West Lafayette Ridgewood; 14. East Liverpool; 15. West Muskingum; 16. Byesville Meadowbrook; 17. Newcomerstown; 17. Richmond Edison; 19. Coshocton. West Muskingum at Magnolia Sandy Valley, 7 p.m.
Newcomerstown at Berlin Hiland, 7 p.m.
Richmond Edison at Bellaire 7 p.m.
Cadiz Harrison Central vs. West Muskingum-Magnolia Sandy Valley, 2 p.m.
Martins Ferry at Lore City Buckeye Trail, 2 p.m.
Coshocton vs. Newcomerstown-Berlin Hiland winner, 2 p.m.
Rayland Buckeye Local at Belmont Union Local, 2 p.m.
Barnesville vs. Richmond Edison-Bellaire winner, 2 p.m.
East Liverpool at Sugarcreek Garaway, 2 p.m.
Byesville Meadowbrook at McConnelsville Morgan, 2 p.m.
West Layfayette Ridgewood at Zoarville Tuscarawas Valley, 2 p.m.
Cadiz Harrison Central-West Muskingum-Magnolia Sandy Valley winner vs. Martins Ferry-Lore City Buckeye Trail winnerCadiz Harrison Central vs. West Muskingum-Magnolia Sandy Valley, 7 p.m.
Coshocton-Newcomerstown-Berlin Hiland winner vs. Rayland Buckeye Local-Belmont Union Local winner, 7 p.m.
Barnesville-Richmond Edison-Bellaire winner vs. East Liverpool-Sugarcreek Garaway winner, 7 p.m.
Byesville Meadowbrook-McConnelsville Morgan winner vs. West Layfayette Ridgewood-Zoarville Tuscarawas Valley winner, 7 p.m.
BELMONT — State-ranked New Philadelphia and Indian Creek top the field in the Division II East district girls basketball tournament. Top-ranked and unbeaten New Philadelphia, the two-time defending district champion, gained the top seed and 10th-ranked Indian Creek the second seed in the upcoming sectional-district tournament. Eastern Buckeye Conference tri-leader Minerva (13-3) is the fourth seed and Beaver Local (10-7) is the 12th seed. The Beavers will open sectional play by hosting 14th-seeded Cambridge on Feb. 18. SEEDS: 1. New Philadelphia; 2. Indian Creek; 3. Maysville; 4. Minerva; 5. Dover; 6. River View; 7. St Clairsville; 8. John Glenn; 9. West Holmes; 10. Steubenville; 11. Indian Valley; 12. Beaver Local; 13. Philo; 14. Cambridge; 14. Zanesville; 16. Claymont; 17. Carrollton. Cambridge at Beaver Local, 7 p.m.
Cambridge-Beaver Local winner at Zanesville Maysville, 7 p.m.
Millersburg West Holmes at Dover, 7 p.m.
New Concord John Glenn at Minerva, 7 p.m.
Duncan Falls Philo at Wintersville Indian Creek, 7 p.m.
Carrollton at New Philadelphia, 7 p.m.
Urichsville Claymont at Zanesville, 7 p.m.
Steubenville at St. Clairsville, 7 p.m.
Warsaw River View at Indian Valley, 7 p.m.
Cambridge-Beaver Local-Zanesville Maysville winner vs. Millersburg West Holmes-Dover winner, 2 p.m.
New Concord John Glenn-Minerva winner vs. Duncan Falls Philo-Wintersville Indian Creek winner, 2 p.m.
Carrollton-New Philadephia winner vs. Urichsville Claymont-Zanesville winner, 2 p.m.
Steubenville-St. Clairsville winner vs. Warsaw River View-Indian Valley winner, 2 p.m.
Cambridge-Beaver Local-Zanesville Maysville-Millersburg West Holmes-Dover winner vs. New Concord John Glenn-Minerva-Duncan Falls Philo-Wintersville Indian Creek winner, 7 p.m.
Carrollton-New Philadephia-Urichsville Claymont-Zanesville winner vs. Steubenville-St. Clairsville-Warsaw River View-Indian Valley winner, 2 p.m. MINERAL RIDGE — The Mineral Ridge Division III sectional-district basketball tournament is top heavy. Sixth-ranked McDonald (18-0) and ninth-ranked Western Reserve (16-3) received the top two seeds at Sunday’s girls draw. McDonald handed Western Reserve two losses this season on the way to the Mahoning Valley Athletic Conference title. Brookfield is seeded third and Lisbon (13-5) fourth. Last season, Lisbon won the district title — its first since 1991. Lisbon will host Wellsville in the sectional opener on Feb. 20. SEEDS: 1. McDonald (18-0); 2. Western Reserve (16-3); 3. 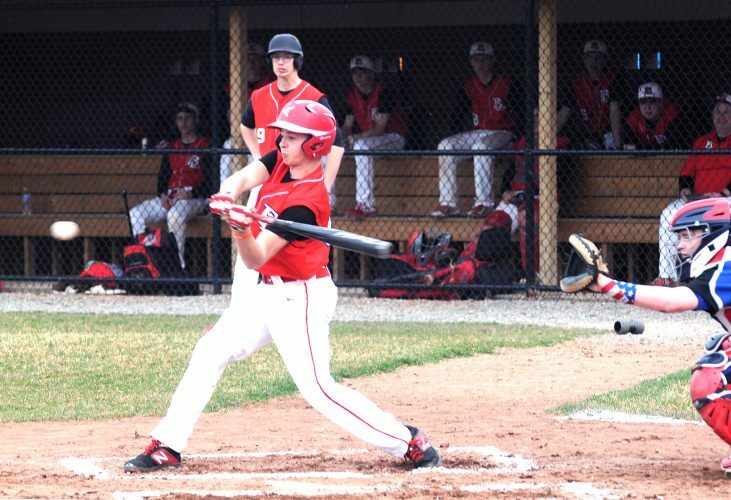 Brookfield (12-5); 4. Lisbon (13-5); 5. Jackson-Milton (8-10); 6. Lordstown (8-7); 7. Leetonia (10-9); 8. Valley Christian (6-9); 9. Sebring (4-14); 10. Southern Local (4-14); 11. Heartland Christian (2-10); 12. Lowellville (3-15); 13. Wellsville (0-18). Sebring at Valley Christian, 7 p.m.
Wellsville at Lisbon, 7 p.m.
Lowellville at Jackson-Milton, 7 p.m.
Southern Local at Leetonia, 7 p.m.
Heartland Christian at Lordstown, 7 p.m.
Sebring-Valley Christian at McDonald, 1 p.m.
Wellsville-Lisbon winner vs. Lowellville-Jackson Milton winner, 1 p.m.
Southern Local-Leetonia winner at Western Reserve, 1 p.m.
Heartland Christian-Lordstown winner at Brookfield, 1 p.m.
Sebring-Valley Christian-McDonald winner vs. Wellsville-Lisbon-Lowellville-Jackson Milton winner, 6 p.m.
Southern Local-Leetonia-Western Reserve winner vs. Heartland Christian-Lordstown-Brookfield winner, 7:45 p.m.
STRUTHERS — The Struthers Division III sectional-district girls basketball tournament is the one everyone has been looking forward to all season. The two teams that met in the district final last year, Salem and South Range, received the top two seeds in Sunday’s draw. Salem (13-5) is the top seed and South Range (10-7) the second seed. South Range and Ravenna Southeast (12-4) tied for the second seed, but it was given to the Raiders based on the most vote above or equal to seed. South Range has won the district title three of the last four years. In regular-season action, Salem won at South Range, 48-44, on Dec. 28. Eastern Ohio Athletic Conference champion Columbiana (15-3) is the fourth seed after capturing its sixth straight league title. In a possible playoff preview, Columbiana will play at Salem in regular-season play on Feb. 11. Fifth-seeded Liberty, sixth-seeded Crestview and seventh-seeded East Palestine all sport double-digit victories. East Palestine (15-4) has its most wins in 13 years. Sectional play will be held Feb. 20 and Feb. 23. SEEDS: 1. Salem (13-5); 2. South Range (10-7); 3. Ravenna Southeast (12-4); 4. Columbiana (15-3); 5. Liberty (10-6); 6. Crestview (11-5); 7. East Palestine (15-4); 8. United (9-9); 9. Springfield (9-8); 10. Rootstown (9-9); 11. Atwater Waterloo (6-11); 12. Campbell Memorial (2-13). Springfield at United, 7 p.m.
Campbell Memorial at Liberty, 7 p.m.
Rootstown at East Palestine, 7 p.m.
Atwater Waterloo at Crestview, 7 p.m.
Springfield-United winner at Salem, 1 p.m.
Campbell Memorial-Liberty winner at Columbiana, 1 p.m.
Rootstown-East Palestine winner at South Range, 1 p.m.
Atwater Waterloo-Crestview winner at Ravenna Southeast, 1 p.m.
Springfield-United-Salem winner vs. Campbell Memorial-Liberty-Columbiana winner, 6 p.m.
Rootstown-East Palestine-South Range winner vs. Atwater Waterloo-Crestview-Ravenna Southeast winner, 7:45 p.m.
AUSTINTOWN — Two-time defending district champion West Branch has its work cut out this season. The Warriors (13-5) received the fourth seed at the Austintown Fitch Division II sectional-district girls basketball draw Sunday. Fourth-ranked and unbeaten Poland is the top seed, 12th-ranked Youngstown Mooney the second seed and third-ranked Youngstown Ursuline the third seed. West Branch opens sectional play on Feb. 21 as the Warriors host the Youngstown Chaney-Howland winner. The Warriors has more work before tournament time as they are tied with Salem and Minerva at the top of the Eastern Buckeye Conference with three league games to play. Seeds: 1. Poland (17-0); 2. Youngstown Mooney (10-2); 3. Youngstown Ursuline (10-4); 4. West Branch (13-5); 5. Howland (11-6); 6. Struthers (9-7); 7. Niles (10-8); 8. Youngstown East (8-9); 9. Mantua Crestwood (5-12); 10. Hubbard (4-12); 11. Cortland Lakeview (0-17); 12. Youngstown Chaney (0-15). Mantua Crestwood at Youngstown East, 1 p.m.
Youngstown Chaney at Howland, 1p.m. Hubbard at Niles, 1 p.m.
Cortland Lakeview at Struthers, 1 p.m.
Mantua Crestwood-Youngstown East winner at Poland, 7 p.m.
Youngstown Chaney-Howland winner at West Branch, 7 p.m.
Hubbard-Niles winner at Youngstown Mooney, 7 p.m.
Cortland Lakeview-Struthers winner at Youngstown Ursuline, 7 p.m.
Mantua Crestwood-Youngstown East-Poland winner vs. Youngstown Chaney-Howland-West Branch winner, 6 p.m.
Hubbard-Niles-Youngstown Mooney winner vs. Cortland Lakeview-Struthers-Youngstown Ursuline winner, 7:45 p.m.